A new study from the Centre on Regulation in Europe (CERRE), which did a systematic analysis of all of the 157 broadband measures that have been notified to the European Commission by Member States (inc. UK) between 2003 and August 2018, has warned that the current level of public funding is “insufficient“. At present the existing Digital Agenda for Europe (DAE) strategy, which was originally adopted in May 2010, is still trying to deliver on its promise of ensuring that very home in the EU can access a 30Mbps+ capable Next Generation Access (NGA) superfast broadband connection (plus 50% subscribed to a 100Mbps+ service) by the year 2020. The UK is closer than most to achieving this, but others are well behind (here). More recently the EU has proposed a non-binding “Gigabit Society” commitment that would require member states to ensure that everybody could access a minimum speed of 100Mbps by 2025 (focus on FTTP), which is likely to be much harder to achieve outside of dense urban areas (in urban areas most EU countries, including the UK, can already deliver such speeds via existing cable or fibre-based networks and even 5G is a future option). However the authors estimate that public funding from all sources to support broadband deployment in the period to 2020 amounts to around €7 billion per year. “At this rate it will take Europe nearly 30 years to meet its FTTH targets,” said the report. They also found wide variations in public funding between Member States: in the period 2003-18 France spent around €215 per capita and Italy €145, whilst the majority of Member States spent less than €100 per capita and some less than €10. Overall 65% of public funding for broadband comes from Member States. “We found that broadband infrastructure receives less than 5% of available European funds, despite being a strategic priority for Europe and for the Juncker Commission. Current public funding is insufficient if Europe is to achieve its Gigabit Society targets. It is also important that whatever public funds are allocated, they are also used efficiently. At the European level, the most significant source of State Aid for broadband is the Regional Development Fund (ERDF). This is one of five ‘structural funds’ which together form the European Strategic Investment Fund (ESIF). In addition, the Agricultural Fund for Rural Development (EAFRD) has funds of €100 billion in the period 2014-2020, some of which have also been applied to broadband (this fund is much smaller than the ERDF and has a wider set of funding objectives). The data suggests that no Member State has allocated more than 3.6% of their European funds (ERDF and EAFRD) to broadband infrastructure in the period 2014-2020. The Czech Republic, France and Italy allocate a relatively higher proportion of their funds to broadband (relative to relevant peers), each for different reasons. 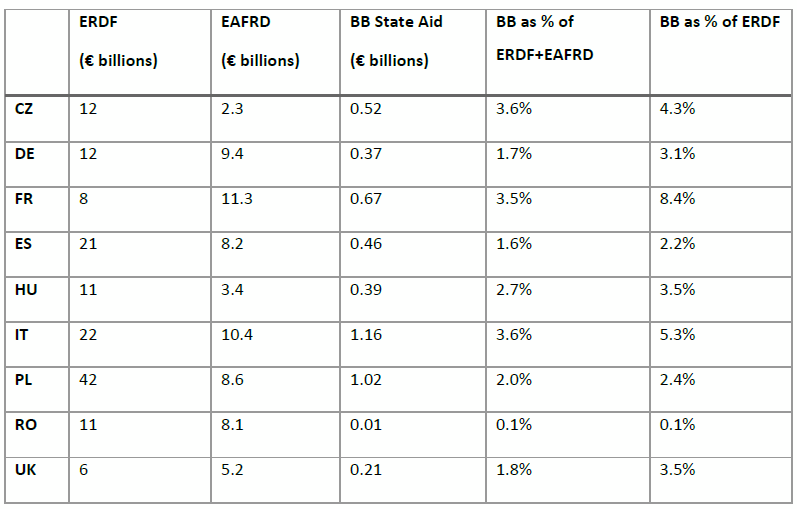 By comparison Spain, Germany and the UK each allocate a “relatively low proportion” of both their overall funds and their ERDF to broadband. Spain receives similar levels of structural funds to Italy but allocates much less to broadband. Germany receives less funding than either Spain or Italy, but significantly more than the UK. In response the report makes several recommendations. 1. Mobilise grassroots interests in public funding of broadband with an EU-wide competition for funds. 2. Improve coordination between the European Investment Bank and the European Commission’s DG Competition to ensure that in each case the appropriate public funding instrument is used. 3. 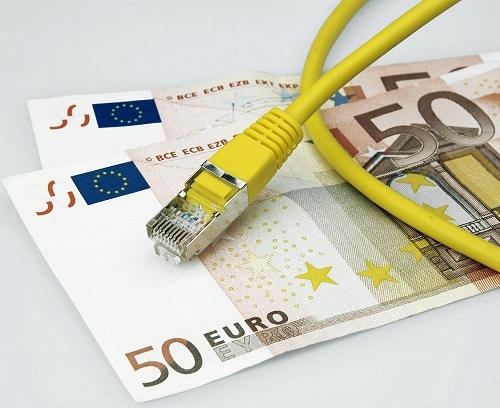 Increase the share of European funds allocated to broadband. · simplify the regime so that measures to protect competition align with those that already apply to commercially-funded networks under the Significant Market Power regime and ensure enforcement. 5. Require Member States to provide more data to enable the evaluation of the effectiveness of State Aid measures. ‘Effectiveness’ should be measured by whether public funds achieve the goal of extending broadband services to the greatest number for the lowest cost to the taxpayer, and not simply in terms of competition or the time taken to approve the project. At this point there remains a question mark over how relevant all this will be to the UK when we leave the EU next year, although the current draft deal does appear to tie us in to some EU State Aid rules for at least another couple of years (we’ll wait to see if this deal survives to become a final text examining it). On top of that the UK doesn’t have any plan for meeting the EU’s latest target. At present they indicate that around 98% of the UK should be covered by “superfast broadband” by 2020 and there’s an aspiration to reach universal coverage of Gigabit capable “full fibre” (FTTP) by 2033 (this will require several £ billion but so far only a small fraction has been committed), but nothing about achieving universal coverage of 100Mbps+ “ultrafast broadband” by 2025. The immediate problem in the UK to turn around all the existing funding within the processes already and convert into coverage. Best part of a £1bn in the BDUK pipeline, £712m minus £130m coming back from BT, and each LA needs to declare their investment account balances including any BT capital sitting there or owed. Resources to do the work and overcoming the mis-use of commercial confidentiality agreements seem as big as barriers as the funding. Not possible for all. 98% is viable…. I don’t think the UK will hit the 98% target by 2020 – that would need all the current plans to be completed on time, and there are a growing number of BDUK schemes that are falling way behind. After Brexit I think the UK government will lose the political will to push broadband – they will have more pressing issues to worry about. Falling back on the B-USO from 2021 would be snatching a defeat from what ought to be huge upside for the rural economy and what ought to be a big piece of momentum for the 2033 goal. Depends where you look. Some of the altnets (but others are racing ahead) are having problems but OR is definitely scaling up over the last year. I think late 2020 is achievable still. Well, where I’m looking there seems to be no chance of getting close to 98% superfast coverage by 2020. The Forest of Dean currently stands at around 81%. There are 14% that will fall under USO. Gigaclear have the contract to roll out FTTP to the remaining properties, but have fallen so far behind they have had to go back to the drawing board to try to come up with a new plan. The old plan went out to 2022, and they couldn’t meet that. There is currently no plan in place. They are having big problems in the CDS area, and don’t have enough subcontractors there. They are having problems in Northamptonshire, and delays in other areas too. I can see no way they can find enough (any?) subcontractors to complete the works at an accelerated rate to meet a 2020 target. Joe, BT are scaling up in urban (10k-13k FTTP a week depending on which slide is being used), the rural work is likely to be less than 300k premises this year, small given the overall budget available. The 98% figure is of course a national average, so that means some areas will finish with universal coverage and other areas will be below 98%. At the current rate of progress 98% by the end of 2020 has a very strong likelihood of being achieved. It is just possible that 98% will be achieved as a national average if there is 100% coverage in urban areas, but quite large areas (such as the Forest of Dean constituency) are likely to way way below that. And once 98% has been reached I strongly suspect that will be seen as “job done”, and the remaining areas will be ignored completely. The USO exists to deal with the last X%. its difficult to gauge accurately but many urban and semi urban altnets big announcements recently combined with ORs fairly typical start slow and steady ramps look pretty good for 98% @ 21 and actually a decent chunk over (certainly in 2020-23 window). I think USO is now much more likely to be closer to 1% than its closer to 2% in the window. Only 1% of properties may fall under USO nationally by 2020, but there are currently 14% of properties in the Forest of Dean that fall below the USO threshold, and there are no plans currently in place to address that before 2020 (or ever). That’s not quite true. The USO is legal right to request a broadband connection of at least 10mbps. The reality is that in almost all cases where you claim USO and they provide it you will get well beyond that figure. The people who will lose out are those >10 who can’t claim it and are in an area with no immediate upgrade plans. Although switch off of ADSL (etc) may bring them some small gains. Your area may be 4g/wifi I can’t speak to that as I don’t know the infrastructure well enough its not my patch. The costs are less certain. I suspect that some of the costs will drop (many have been very conservative) as fttp keeps scaling and the end of some big rollout projects frees up skilled staff/contractors. The 98+ is national, obviously there will be some areas that fall well short. But if as I suspect the 98 is overshot by some margin it does make it easier to get local/national gov + OR/Altnets to reconsider some of the areas on the edge of viability with quite small subsidies. If BT are designated the USO Provider of choice by Ofcom (as seems likely), then according to BT’s USO proposal, they will almost certainly use EE’s 4G network to deliver the vast majority of USO applications (or just say that, if you’re covered by an EE 4G signal, you can just order a 4G Mobile Broadband package, no further USO intervention is required). So, basically they will use their 4GEE Packages (https://shop.ee.co.uk/dongles/pay-monthly-mobile-broadband/4gee-router/details#) to cover the USO – unless you can’t get an EE 4G signal. I expect that’s what I will be offered in my locality. Also – I forgot to add – 10 Mbps downstream & 1 Mbps upstream, while not great, is supposed to be an absolute bare minimum speed for USO connections – hopefully most will be higher than that. The main issue with USO specification I can see is they only need to offer 100Gb data per month – again, covered by EE’s 4G Mobile Broadband packages. Yes, I think you are right that they will offer 4G. I do use 4G at the moment (load balanced with ADSL). I work from home, I need to run servers and incoming VPN, so have to have a static IP address, I use Skype etc so need low latency, and I transfer quite a lot of data (I used my 100GB/month in less than a week last month). The 4G is very variable in speed and latency, and I have to use a L2TP tunnel to get a static address. If I didn’t have an EO line I would be paying <30% of what I pay now for 4 times the speed, lower latency, unlimited data, and a more reliable connection. However, I expect 4G to be the best solution I will ever see, and it just isn't good enough. EO should get sorted. Doesn’t mean you will suddenly get great speed but you’ll prob get more. I do exactly the same as you: also on an EO line, with a slow-ish (2 – 2.5Mbps downstream) ADSL connection, and I use my DrayTek Vigor 2860 Vac router to load balance it with a 4G connection. Also like you I’m working from home. I currently only have a 32Gb per month SIM (on a 30-day rolling contract), which I just about manage to use as a “turbo boost” for my ADSL – but am thinking about one of the EE packages, would love the 200Gb per month, but it’s still expensive (£50 per month) – 100Gb at £35 per month is tempting, still expensive compared to fixed line: although according to that BT USO proposal document, I would expect all the 4G plan prices to gradually fall over the next year or so. In the meantime, I’m waiting to hear if our local BDUK project (in my case, Superfast Cymru or whatever the next phase in Wales will be called) will release details of who will be included in the next batch of upgrades – and if our hamlet isn’t included, will investigate setting up our own local community broadband project to drum-up interest and research options (e.g. Community Fibre, Fixed Wireless [WISP], TV Whitespace, 4G as the fall-back option, etc). While 4G has fixed data caps and CGNAT issues (at least with EE – I’d love to try the Three 4G option, but we can’t get a 4G signal with Three here, only 3G), I’d always want to keep my slow but unlimited data fixed line ADSL link to combine with the 4G, so that’s an extra expense of having 2 broadband packages! The joys of living in rural locations (and unfortunately circumstances mean I can’t move even if I wanted to!). 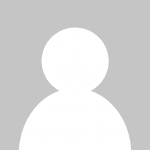 @Joe, there are no plans to resolve the remaining EO lines on my exchange. Originally the exchange was all EO, but the BDUK FTTC rollout moved 70% to two cabinets. BT wanted to move all the lines, but the BDUK vetoed that as some lines in the remaining bundles wouldn’t have got >30Mbps. BT have no plans to do anything about the remaining EO lines. @Adam, I use a Vigor 2860n+ to load balance ADSL with a Three 4G 100GB/month deal. I can now get EE, but Three is cheaper (although I’m tempted to try EE to see if it is more consistent). I use AAISP’s L2TP at £10/month to get static IP (IPv4 and IPv6) and avoid any CGNAT issues – it works quite well, but you lose a bit of speed and gain a bit of latency. With ADSL, 4G, and L2TP the cost adds up, and still doesn’t match FTTC. In our area Fastershire deliberately left small pockets of properties out of the FTTC rollout to keep average costs down. The remaining small groups of houses are now uneconomic for any technology. They had planned Gigaclear FTTP, but after 2 years and absolutely no progress it’s back to the drawing board. We have looked at DIY solutions, but there is no affordable backhaul available. We have yet to understand Ofcom’s final view on the USO. However to be clear in BT Group’s response to the proposed USO that they clearly state that if premises can already access a FWA product from BT or another provider they will not be eligible for the USO provision via Openreach. BT estimates this may be 450k of the 600k premises. So yes BT (EE) will be offering FWA broadband packages based on 4G/5G but its availability may exclude premises from the USO. So they might not even get help with an external aerial. A casualty of such a low USO target and hardly socially inclusive. @AnotherTim: thanks for the info on AAISP’s L2TP package, I think I’ve come across that before. I was under the impression that Three didn’t use CGNAT though? I think the 4G providers will have to overcome the various issues (limited data, CGNAT) if they want to truly challenge fixed-line connections in future with 4G & 5G. There is talk of possible hybrid packages (possibly true ADSL + 4G line bonding) becoming available next year onwards, which would help. They claim to be able to help both communities & even individuals (https://whitespacetechnology.net/howtvwsworks/products/for-individuals/ – stating they’ve yet to find somewhere they can’t provide service to!). Of course, with this and more traditional WISPs, they all need suitable backhaul – but the likes of microwave links or Ubiquiti wireless links can cover many kilometres – so maybe worth a try if you haven’t already. I have no idea of their pricing of course, but will investigate it in future probably as a community option. I’m in exactly the same situation as you, FWIW (but without the small extra option of using Three – incidentally don’t they have an unlimited data plan now? http://www.three.co.uk/Store/SIM/Plans_for_phones – I think Ofcom ruled that they can’t restrict SIM usage, so you should be able to use phone SIMs in 4G routers?). @Meadmodj, I do expect most potential USO properties will be able to get a 4G connection so won’t be eligible. Whether or not packages will be affordable is an unknown. The USO requires national pricing, but that could be expensive everywhere (which wouldn’t affect anyone with a choice of broadband). @AdamH, CGNAT isn’t so much of a problem with Three, but static IPs are still a problem (which L2TP solves). I haven’t tried Whitespace Technology, but have looked at them. 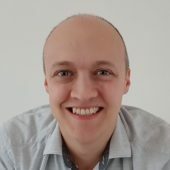 I have tried quite a few other companies and despite claims of being able to connect anyone, they need 30 people to sign up to make it viable. The way Fastershire fragmented the remaining properties mean there are groups of around a dozen which is not enough. I could get a leased line for around £40,000 over 3 years, but even splitting that between neighbours still gives a cost of over £100 per month – which is too much for most people (which I guess is where the 30 properties that the ISPs need comes from). I have experimented with Ubiquiti links – they are great (I use quite a bit of Ubiquiti kit – my WiFi covers several acres 😉 ), but I don’t have anywhere to connect the other end to. I did try to get one ISP that has wireless coverage of the Cotswolds (a bit over 10 miles away) interested, but no luck. I may try a Three AYCE contract, others have said they use several hundred GB without problems. This is the same problem we have – we’d really struggle in our hamlet to get 30 people to sign up (there are under 40 premises in total) – 20 might be just about do-able, if I can get people enthusiastic, but even that is not easy – at least one local WISP did mention the possibility of installing a local relay mast if 20 people commit to 12 months service. I’m just waiting to see if we’re included in the Welsh Phase 2 rollout of upgrades first. I know what you mean about fragmentation – the same has happened with us, the 2 villages either side of our hamlet can mostly now get FTTC, and that has fragmented us into a less-viable area (otherwise, a community project could have included these 2 larger villages) – I think fragmentation combined with lack of available decent capacity & speed backhaul is going to be a real problem for decent future broadband upgrades in rural areas. I just wish that Three was available in my area – our only realistic option is is much more expensive EE. We get Vodafone 4G signal too, but they don’t seem interested in offering decent amounts of data for 4G as a home broadband solution. If Ofcom insisted that mobile providers in sparse rural areas shared cell masts, that would help solve that issue – not that I think that will ever happen. @AdamH, I’m lucky that Three and EE share a mast about a mile from my house with clear line of sight. I use a Mikro Tik SXT LTE high gain antenna/router, so get a full signal. It is the poor backhaul from the mast that limits the speed. Over time it is gradually getting slower, presumably as more people use mobile data (I have recommended Three HomeFi to several locals, which probably wasn’t a good idea). There are lots of nearby areas with no mobile coverage at all (due to hills and lots of trees), so 4G won’t be a solution for everyone. That’s the problem with 4G, as more people use the same cell & it becomes more congested, the speed drops. At least you have the option of Three. I’ve heard of the MikroTik combined outoor antenna/4G router – it sounds like a good option to maximise your 4G reception. Zyxel do a similar one (the ZyXEL LTE7410). It may be worth you trying EE (with a PAYG SIM for testing purposes) to see if it’s better in terms of speed – the main issue then being the data caps and pricier packages. I usually get something between 15 & 30 Mbps downstream (usually in the low 20’s) and 5 & 20 upstream on EE here (I have had up to 50Mbs down, although not recently) – and that’s without an external antenna, I will be installing one soon. It’s certainly an improvement over 2Mbps ADSL! I do think that TV Whitespace sounds like an interesting possibility and could be promising for the areas without 4G (and 5G will be a long time coming to rural areas). Worth exploring at least. Hopefully we’ll eventually all get our FTTP though! Meadmoj .. I have exchanged with Ofcom on whether LA could delay B-UsO while they complete BDUKs works. At present these is no such provision in the B-USO law as it stands. So BDUK and B-USO bump into each other. I have estimated 14 English counties who need to follow Scotland, Wales and fingers crossed NI on another round of BDUK work. @NGA – ‘exchanged’ Odd word, what do you mean?